The visible-light Hubble image of the Lagoon Nebula shows a dust-and-gas landscape that is being sculpted by ultraviolet radiation and stellar winds from a powerful young star. The star near the center of the image is known as Herschel 36. It’s about 200,000 times brighter than our Sun, 32 times more massive, and eight times hotter. Herschel 36 iis a baby star, only 1 million years old. The star-filled image at right, taken by Hubble in near-infrared light, is a very different view of the nebula. Infrared light can penetrate clouds of gas and dust. The most obvious difference thes infrared and visible photos of this region is the abundance of stars that show up in the infrared field of view. Most of them are more distant, background stars located behind the nebula, but some are young stars within the Lagoon Nebula. The giant star Herschel 36 appears even brighter in infrared. The Lagoon Nebula, aka M8, is about 5,000 light years away in the constellation of Sagittarius. 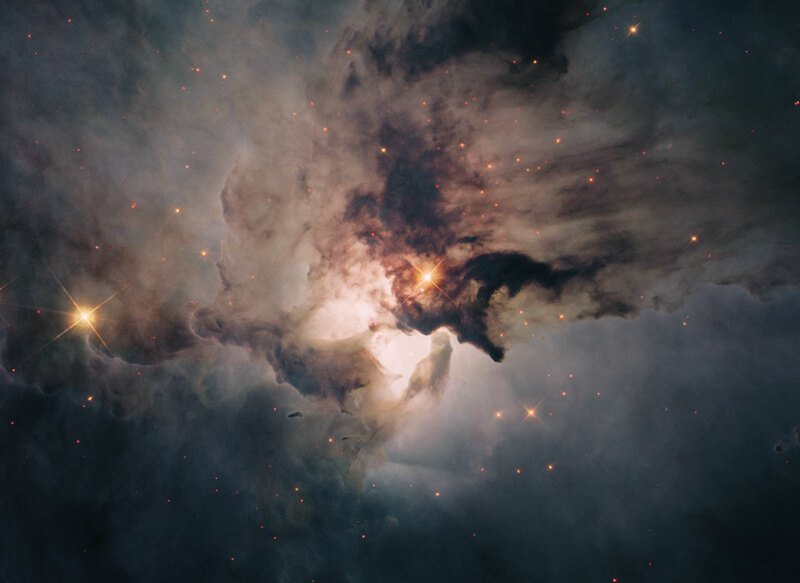 The center of the Lagoon Nebula is a maelstrom of star formation. The long funnel-shaped clouds on the lower left are roughly half a light-year long and have been formed by extreme stellar winds and intense energetic starlight. An extremely bright nearby star, Hershel 36, lights the area. Dust hides or reddens other hot young stars from our point of view. As energy from these stars flows into the cool dust and gas, the large temperature differences between adjoining regions can create generating shearing winds which may cause funnels to form. The Lagoon Nebula, also known as M8, lies about 5,000 light years distant toward the constellation of Sagittarius. Its center is a maelstrom of star formation. The two long funnel-shaped clouds near the center of the picture are each roughly half a light-year long. They were formed by extreme stellar winds and intense energetic starlight. An exceptionally bright nearby star, Herschel 36, dominates the area. Walls of dust hide and redden other hot young stars. This picture spans about 5 light years and combines several images taken by the Hubble Space Telescope.